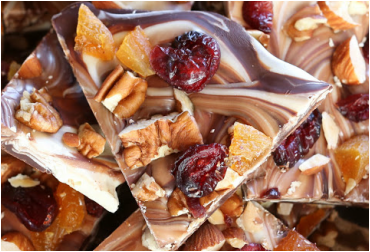 Try this delicious combination of Belgium Milk chocolate, white chocolate chunks swirled, candied orange chunks, cherries and walnuts. We then finish this beautiful bark with GINGER'S CRUSH, our orange and ginger infused sea salt. The combination is mouthwatering! You'll wish you bought an extra box and hid it away for a later date! Caramel and smoked almonds come together to captivate our gourmet chocolate fans! This combination is a unique take on bursts of flavor offering the sweet and salty pleasantries we crave!